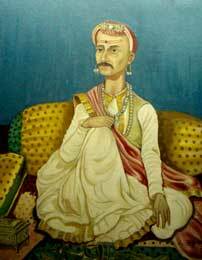 Peshwa Bajirao II (born 1775, ruled 4 December 1796 to 3 June 1818, died 28 January 1851) was the eldest son of Raghunathrao Peshwa and his wife, Anandibai. Though on his deathbed Madhavrao II had (allegedly) named his cousin, Bajirao II, as his heir, his old regent Nana Phadnavis was never comfortable with the idea. He knew that Bajirao resented him and would try his utmost to undermine his authority. He therefore desired that Madhavrao's widow adopt a son whom he would be able to appoint as peshwa so that he himself could rule as regent on the boy's behalf. But Bajirao II (who was in prison) had other plans. He enticed Sardar Baloba Tatya Pagnis, the influential minister of Daulatrao Shinde (Anglicised as 'Scindia'), by promising him Nana's position, lest he persuade Scindia to make him peshwa (as Bajirao II). But Nana's spies informed him of Bajirao's plans. Anticipating Scindia's forces marching into Pune, Nana released Bajirao from prison and made a pact with him whereby Bajirao would be the next peshwa and Nana would continue as chief minister. Bajirao, seeing that he was now completely free, withdrew his original commitment to Sardar Pagnis. Nana was well aware that Baloba Pagnis would try his utmost to extract his pound of flesh from Bajirao, and therefore, before Scindia's forces (led by a disgruntled Baloba Pagnis) could march into Pune, Nana fled to Purander. Sardar Pagnis was angry with Bajirao for breaking his promise, and urged Daulatrao Scindia to appoint Bajirao II's younger brother, Chimnaji Appa, as the next peshwa. The wily Nana Phadanvis tacitly gave his approval for this and bought temporary peace with Pagnis and Daulatrao Scindia (with whom he negotiated to retain his position). 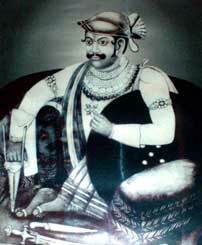 Initially Nana had wanted to declare Shahu II of Satara as king and rule as his prime minister. 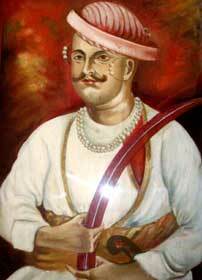 But due to Shahu's uncertainties, Nana extended wholehearted support to Chimnaji Appa as the next peshwa. Bajirao II was once again confined to prison. Meanwhile, Sardar Pagnis, who would settle for nothing short of replacing Nana Phadanvis, was making plans to seize him. Nana was forced to flee again. Once again he made a pact with Bajirao to get him released from prison and make him peshwa. To achieve this they had to wean Daulatrao Scindia away from Pagnis' side over to their own. They used the beautiful daughter of a sardar by the name of Sakharam Ghatges (of Kagal) as bait for Daulatrao Scindia. Daulatrao, who was enamoured by the girl's beauty, soon married her and was won over to the side of Bajirao and Nana. This isolated Sardar Pagnis. The operation to declared Bajirao II the new peshwa and Nana Phadanvis his prime minister. However, Bajirao II was never in favour of Nana Phadanvis, whom he held responsible for ousting his father, Raghunathraos, from power. 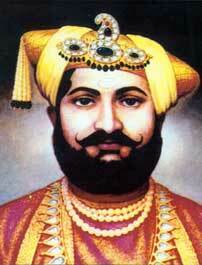 Their old rivalry resurfaced and Bajirao II induced Sardar Sakharam Ghatge to put Nana Phadanvis behind bars. Later, finding Daulatrao Scindia and Sakhatam Ghatge difficult to control, Bajirao II freed his rival, Nana Phadanvis, to use the latter's guile against Scindia. But at the same time he kept Nana's influence in the court very limited. By now, Nana Phadanvis was a tired man and within a couple of years he had died (in 1800), leaving Bajirao II to his dependency on Daulatrao Scindia. Meanwhile, Tukoji Holkar had died at Indore leaving behind two sons, Kashirao and Malharrao II, and two illegitimate sons, Jaswantrao (Yeshwantrao) and Vithoji. Kashirao was the elder so he was made Tukoji's successor, but this appointment was challenged by Malharrao. Even the illegitimate brothers Jaswantrao and Vithoji supported Malharrao's cause. But Kashirao asked Daulatrao Scindia for his help. Daulatrao tried to seize Malharrao in person and in the fight that ensued Malharrao II was killed. His son, Khanderao, was then taken as a prisoner to Pune. Jaswantrao fled to Nagpur while Vithoji fled to Kolhapur. Vithoji was later captured near Bhamburda and taken to Pune. Jaswantrao built himself a large army and planned an attack against Scindia who had enthroned himself at Pune (much to the peshwa's dismay as the latter was under his control). Scindia sensed an attack by Jaswantrao was looming, so he extracted 4,700,000 rupees from the peshwa and marched out of Pune. The armies of Scindia and Jaswantrao clashed, and after a fierce battle Jaswantrao was forced to retreat. Peshwa Bajirao II now felt himself to be free of Daulatrao Scindia and now desired to establish his complete control over Pune. He first decided to eliminate those families whom he considered his rivals (like the Raste family) or those that were in opposition to his father, Raghunathrao. The vindictive Bajirao II was merciless with his enemies. Even Vithoji Holkar (brother of Jaswantrao Holkar) and a friend of Nana Phadanvis (and someone whom Bajirao believed fancied Amritrao as a peshwa rather than Bajirao II), was tied to an elephant's leg and dragged through the streets of Pune until he died. Meanwhile Jaswantrao Holkar had sacked Pune and, after installing the peshwa's brother, Amritrao, in the place of Bajirao II, he had left for Indore. The British army accompanying Bajirao II entered Pune. This force was led by General Arthur Wellesely (brother of Lord Mornington, the governor general) and on the way it had been joined by the peshwa's aides such as Patwardhan, Bapu Ganesh Gokhale, Appa Nipanikar, Patankar and Vinchurkar (the grandson of Vithal Shivdev Vinchurkar). Amritrao was pensioned off by the British to Benaras with his family. Bajirao II was once again reinstated as peshwa at Pune. Scindia did not appreciate the peshwa's proximity to the British and nor did Raghuji Bhosale of Nagpur. Instead, both resented the fact that Bajirao had preferred the help of a foreigner over their own. They also felt that the British were unnecessarily interfering in what they considered to be purely Maratha affairs. Therefore, they decided to punish the British and collected together a large army with which to inflict that punishment. Scindia was confident of victory over the British, mostly thanks to his strong artillery and cavalry which were commanded by a Frenchman called De Boigne. Jaswantrao Holkar, who disdained both Scindia and Holkar, remained aloof. Daulatrao Scindia soon realised that he had underestimated the British. Scindia's army was the first to face defeat, at the hands of General Arthur Wellesley in the Battle of Assaye on 21 September 1803. Raghuji Bhosale followed next at Argaon in Berar on 29 November 1803, forcing Raghuji to sign the Treaty of Devgaon. Scindia's army was also defeated by Colonel Woodington at Bharuch, Champaner, and by Colonel Lake at Aligad, Delhi and Laswari. Bundelkhand was also reduced by Colonel Powell. Earlier in 1791, the peshwa had flirted with the British, when he supported them in their battle against Tipu Sultan of Mysore. For his services Bajirao II had been suitably rewarded with vast lands out of Tipu's territory. Finally, Daulatrao Scindia accepted defeat and on 30 December 1803 he signed the Treaty of Surji Anjangaon. Scindia ceded all his lands between the rivers Jamuna and Ganga and control of his lands in Rajputana. Ahmednagar and Bharuch forts were given away to the British. The Treaty of Surji Anandgaon was supplemented by the Treaty of Burhanpur on 27 February 1804, whereby Scindia became an ally of the British. Meanwhile, British successes alarmed Jaswantrao Holkar, who feared for his possessions. He started planning an attack on them. General Wellesley and his troops clashed with Holkar's forces and before long Holkar had also been subdued. Bajirao's reign was marked by vindictiveness and perfidy. His entire exercise seemed to be acquiring the estates of his nobles, sometimes on the flimsiest of pretexts. Earlier it had been the estates of Sardar Raste, and Nana Phadanvis. This was followed by the estates of the Pant Pratinidhi and Pant Sachiv. Bajirao also unsuccessfully tried to acquire the estates of the Sawantwadi nobles, while they were fighting against the raja of Kolhapur. Bajirao II imprisoned Baburao Phadke, the son of gallant warrior Hari Ballal Phadke, who had so courageously served the Maratha kingdom. He confined Baburao at Fort Bassein where he died. Once this had happened, the peshwa confiscated his property. The peshwa even attached some lands belonging to the Gaekwads of Baroda over a revenue dispute. The British then intervened and had the Gaekwads send a representative to negotiate matters with the peshwa. But the peshwa's aide, Trimbakji Dengale (as stated by British chroniclers), had Gangadhar Shastri, the representative of the Gaekwads, murdered. The British were incensed by this act and arrested Trimbakji. But the man broke free from Thana prison and gathered a small army together. Bajirao was also beginning to dislike the regular interference of the British in his affairs and actively encouraged Trimbakji Dengale. According to British historians such as Kincaid and Duff, Jaswantrao Holkar went insane and had his brother Kashirao and his nephew Khanderao killed. Jaswantrao was succeeded by Malharrao Holkar III under the regency of Jaswantrao's widow. But the British allegedly plotted her death. Malharrao III and his later wife, Bhimabai, continued their struggle against the British in spite of a defeat at Mahidpur. Indore was later incorporated by the British as a princely state in the Central India Agency. By now Bajirao's dislike for the British had turned into intense hatred. He soon started building an army for himself under the guidance of his confidante, Bapu Gokhale. He also tried to seduce the Indian guards in the British army with emoluments. On 5 November 1817, the peshwa's troops clashed with British troops at what we now know as the Battle of Khadki. The peshwa himself retreated to the temple of Parvati, located on a hill top, and watched the entire proceedings of the battle from there. Seeing his army being routed, he fled from the scene (earning himself the nickname 'Palputaa' or the 'Fleeing One'). The remainder of this period of the peshwa's life was spent running from fort to fort (Satara, Nagpur, Kopargaon, and Chanda), furiously pursued by the British forces. Finally, on 3 June 1818, Peshwa Bajirao II surrendered to Colonel John Malcolm at Mhaw near Indore. The British exiled him to the town of Bhramhavarta, or Bithur, near Kanpur on the banks of the Ganges, which was to be his jagir (estate) for his retirement. He was granted a princely pension to meet his royal expenses. Bajirao II had eleven wives, but none could produce a male heir (his only son through his eldest wife, Warnashibai, had died in infancy). Therefore on 6 June 1827, Bajirao II adopted a boy named Dhondopant Narayan Bhat, a son of a priest from Venegaon near Bhor Ghat. Subsequently he adopted Dhondopant's brothers, Sadashivarao and Gangadharrao. 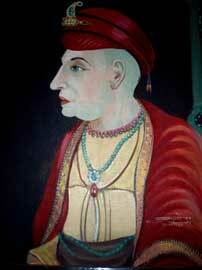 Dhondopant succeeded Bajirao II as peshwa and came to be known as Nanasaheb. Bajirao died in 1851 at the ripe old age of eighty. He remains one of the most controversial peshwas in Maratha history. Most denounce him as vindictive, cruel, myopic and cowardly, especially after he fled the British, while some describe him as a victim of circumstance. Most of Bajirao's formative years were spent in prison. Thanks to this his education was neglected and due to the constant hostilities surrounding him, he grew up to be a very suspicious and vengeful person. He never had the chance to hone the finer qualities of a good ruler, let alone be a capable general like his forefathers. His personal life was also no different to those of the princes of his time. However, to his credit, when he could have very well spent his life in luxury, in the good offices of the British, he chose to respect his sovereignty and crossed swords with the British on more than one occasion. To the credit of Bajirao II, he never surrendered Trimbakrao Dengale to the British, although the man was indeed captured soon after, near Khandesh. Nanasahib Peshwa (born 1824), otherwise known as Dhondopant, is remembered in the pages of history as the last peshwa. He was the adopted son of Peshwa Bajirao II, and the biological son of a priest named Narayan Bhat and a woman called Gangabai. He was declared the next peshwa after the death of Bajirao II. Though Nanasahib professed loyalty to the British, he always resented their sway over the Maratha dominions. Moreover he was incensed when in 1853 he was refused the title of peshwa and his entitlement to the pension by British Governor General Lord Dalhousie. The opportunity to get back at the British came his way, when in 1857 the Indian Sepoy Mutiny broke out in India. Nanasahib collected together a contingent fifteen hundred strong, maintaining that it was for the protection of the British lest the rebellion spread to Kanpur. But on 5 June 1857, he surrounded the 53rd Native Infantry Division of the British East India Company and declared himself to be on the side of the mutineers. Nanasahib then proceeded to loot the treasury. Subsequently he came across a contingent of mutineers who were on their way to Delhi. They were soon induced into his cause. The next morning he attacked the British entrenchment led by General Wheeler. The British held onto the entrenchment until 26 June. Thereafter they surrendered to Nanasahib's army on the assurance that they would be guaranteed safe passage to Allahbad. On 27 June, the British column, consisting of soldiers and their families, reached the Satichaura Ghat, from where they were to proceed by boat. For reasons unknown some of the Indian boatmen jumped in the waters and started swimming to the shore. In the process some lanterns were knocked off their placements, setting some of the boats ablaze. This led to a lot of confusion. Someone fired the first shot, and soon there was exchange of fire between the mutineers and the British soldiers. Tatya Tope, an aide of Nanasahib, was leading the mutineers who fired upon the British. Many Britons were massacred during this dreadful event. The women and the children were pulled away and taken prisoner to the Savada House, and later to Bibighar House (under the guidance of a prostitute by the name of Begum Hussaini Khanum), where they were united with the other imprisoned British womenfolk from Fatehgad. Meanwhile, a strong British contingent (consisting of Sikh soldiers) and led by General Havelock had set out from Allahbad to take on the mutineers at Kanpur and Lucknow. They defeated Nanasahib's army at Fatehgad. Then they defeated the army led by Nanasahib's brother, Balarao, at Aong on 15 July. Claims that they perpetrated atrocities against the Indian villagers on the way were voiced. When these claims reached Nanasahib's camp, the mutineers were furious. They took out their anger on the helpless women and children at Bibighar, mercilessly gunning them down. This sordid incident goes down in history as the Bibighar Massacre. The British forces soon reached Kanpur and captured the town. Nanasahib and his men escaped to Bithur. By now the British troops were aware of the Bibighar massacre and went on the rampage, indulging in arson, looting and killing (often viewed as a traditional practise anyway, when a fortified place was captured by force of arms instead of being surrendered). The British troops later entered Bithur, but found that Nanasahib had escaped from there as well. 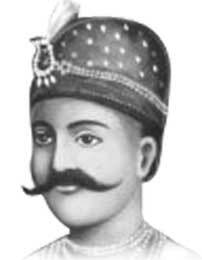 Nanasahib's general, Tatya Tope, continued to offer stiff resistance to the British. 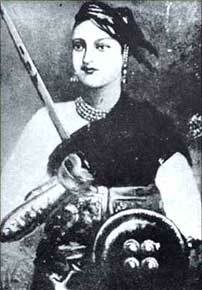 Rani Laxmibai (19 November 1828 - 17 June 1858), also known as Manikarnika, and as Manu, was the queen of Jhansi. She was the daughter of Moropant Tambe, a courtier of Peshwa Bajirao II, and gained her position by marrying Gangadharrao Newalkar, king of Jhansi. Her son died in infancy and was soon followed by her husband. Having no son she wanted her adopted son, Damodar Rao, to succeed her but the British would not allow it. When they laid siege to Fort Jhansi, Rani escaped and joined the cause of the mutineers in 1858. The mutineers captured the fort of Gwalior and carried on its defence alongside the other rebels. This brave woman preferred to fight the British rather than surrender and met her glorious death on the battlefield at Kotah ki Serai, Phoolbagh, near Gwalior. General Sir Hugh Rose commented upon her death, saying that the rani "remarkable for her beauty, cleverness and perseverance" had been "the most dangerous of all the rebel leaders". Both Rani Laxmibai and Tatya Tope are revered as icons of the First Indian Freedom Movement against the British. Nanasahib's whereabouts after all the events of the Mutiny were never known. Some claimed that he escaped with his family to Nepal, while others stated that they had spotted him in Constantinople. Someone resembling Nanasahib was also caught at Gwalior by Maharajah Scindia, but it was never confirmed that this was Nanasahib. The last Maratha peshwa seemed to have disappeared into thin air. 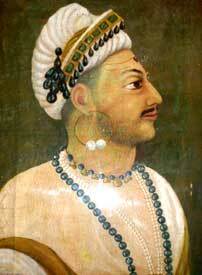 Tatya Tope (born 1814, died 1859) was the son of Pandurangrao Tope, a courtier of Bajirao II. Tatya was born at Yeola in Maharashtra. He and Rani Laxmibai of Jhansi were the childhood friends of Nanasahib Peshwa. He became commander-in-chief of Nanasahib's forces and led an extensive guerrilla campaign against the British forces. His skills in guerrilla stratagems were praised even by his enemies. He was captured after being betrayed by a friend and was executed.